UniDict Mod 1.12.2/1.11.2 is a mod to unify all the things. When we play modded Minecraft, several mods based on their progression add Copper, Tin, Silver, Lead… But since a lot of mods add these common resources, we start to have a lot of equivalent items. This “issue” could be solved manually through MineTweaker, but since there are a lot of machines and resources, it can quickly become boring, and MineTweaker doesn’t give the you the ability to modify everything. Would it not be easier do this automatically? 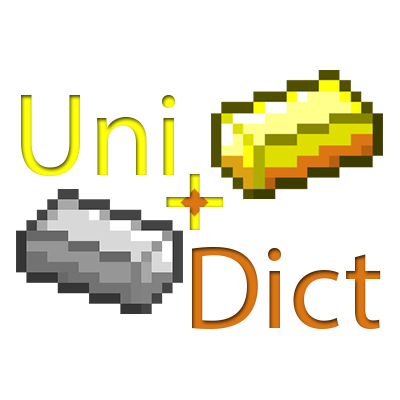 This is what UniDict does, it standardizes the output of all recipes, not just for crafting table recipes, but for lot of machines throughout several mods. It is even intended to unify metals, UniDict can unify anything such as gems or other ressources like Sulfur, Salt, Coal and Obsidian dust, Redstone and Glowstone small dust… using the “S:customUnifiedResources” list in the UniDict config. You just need to be sure that you are trying to unify things that are registered in the OreDictionary.